It is weird how when you take a photo and don’t have a human perspective on it, it is difficult to figure out what is top and what is bottom! 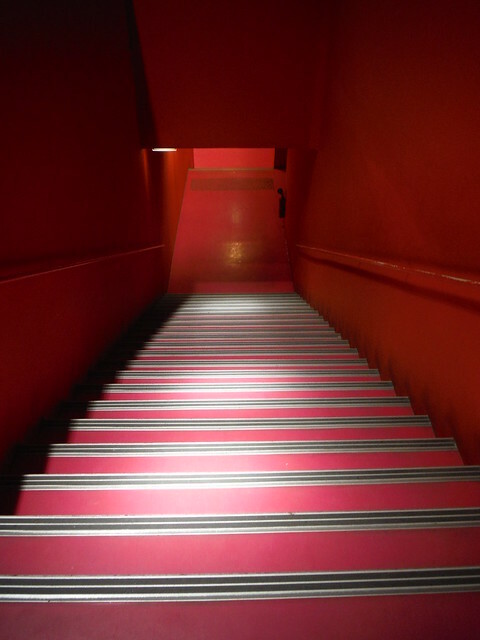 Sample this one that I took at a bathroom stop in Paris – I cannot tell whether the stairs are going up or down – can you? Porcupyn recently acquired a smartphone (not the smartest in circulation, but certainly well imbued compared to his previous flip-up phone) and was very happy about it. On a recent commute to drop off his daughter at school, he got stuck at a traffic light. Somehow he was inclined to take a photo of his daughter, sitting in the backseat, selfie style. Unfortunately, daughter did not want to cooperate. In an attempt to squeeze both subjects – the willing and the unwilling – into the shot, our budding selfographer forgot where he was and failed to espy the cars in front of him pulling away. By the time some smartness came back to him from his phone, the light had changed to yellow and he barely managed to cross the intersection in the same cycle; however, that could not be said about the cars patiently waiting behind him. He failed to get that well-deserved honk. But he did get a good data point to bear out his law!